Columbia Business School (CBS), part of Columbia University, was founded in 1916 thanks in part to a gift from banking executive Ernest McMillin.by A. Barton Hepburn, who at the time was president of Chase Manhattan Bank. The school began awarding the MBA degree in 1945 and became a graduate-only program in 1952. Columbia Business School is part of Columbia University’s main campus, located in the Morningside Heights neighborhood of upper Manhattan. The campus is bounded by Riverside and Morningside Parks, giving students access to park space within a bustling urban location. The university’s total property covers approximately 32 acres. In 2010, the school announced that alumnus Henry R. Kravis (MBA ’69) and Ronald O. Perelman (member of the Board of Overseers) each had pledged to donate $100 million ($200 million total) to aid the construction of a new business school campus, which will be located north of the Morningside Heights campus in Manhattanville. The Henry R. Kravis Building, one of two new facilities that the new campus will house, will feature state-of-the-art technology and an architectural design to encourage collaborative learning. The main campus of Columbia Business School is less than 10 miles away from New York City’s LaGuardia Airport. Most CBS classes take place in Uris and Warren Halls. The former is located at the center of Columbia’s Morningside Heights campus and houses a number of CBS administrative and faculty offices, and the latter is an eight-story building on the corner of 115th Street and Amsterdam Avenue. CBS students can also utilize the full resources of Columbia University, including its extensive library system and fitness center. Columbia boasts about 152 full-time faculty members and also includes a number of adjunct faculty members who allow for Columbia’s vast elective course offerings. In accordance with CBS’s reputation for a focus on finance, approximately 40 percent of its full-time professors teach in the Finance and Economics Division. The Columbia Business School currently enrolls 1,297 MBA students, making it one of the largest top business schools in the world. 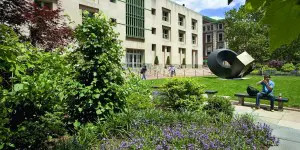 Columbia Business School offers a full-time MBA in addition to an Executive MBA program.